Three blocks from Payette Lake, Alpine Village offers a new residential experience in downtown McCall. 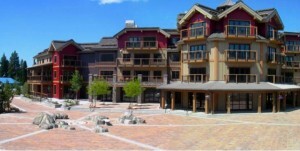 Condominiums are situated around a large plaza with shops, restaurants, offices and a community gathering place. The plaza walkway connects 3rd Street to the rails-to-trails bike path and from there to downtown and Payette Lake. Tree-lined lighted sidewalks integrate with the community along 3rd Street where a public transportation stop connects McCall to other communities in the valley. This mixed-use project illustrates how resort communities can bring housing onto ‘Main Street,’ providing a walkable higher density housing choice while adding to the vibrancy of the community. The architecture is sensitive to the mountain location and historic western designs and uses building materials common to McCall. Each building’s massing and scale steps away from pedestrian spaces to allow for spacious exterior “rooms” for public interaction. Future phases also step back to allow the sun to enter the plaza. Residential parking is covered underground while retail spaces retain convenient surface parking adjacent to, yet outside and screened from, the pedestrian experience. Alpine Village implements McCall’s Downtown Master Plan, which calls for a central business district that is pedestrian oriented, physically attractive, safe and easy to navigate, and retains a mix of goods and services which serve the resident and tourist populations. An exemplary redevelopment located in Priest River, Beardmore incorporates historic preservation, downtown revitalization, and sustainable green building practices in an existing town center. This landmark restoration has sparked a revitalization of Priest River’s historic downtown. One of ten buildings in the downtown core listed on the National Historic Register, the Beardmore Blockis a key component of the City’s past and future. The once decaying shell was given new life and is fully suited for retail at street level with offices above. Restored storefronts, human scale lighting, hanging planters and overhead canopies encourage pedestrian activity. Several existing trees were saved and designated parking for carpools, vanpools and fuel efficient vehicles created. A bike rack, shower and changing room further promotes alternative transportation. Revitalizing the Beardmore as a “green” building makes it a standout redevelopment. Balancing preservation with sustainable practices, the Beardmore is one of only five buildings in the country listed on the Historic Register with LEED Gold certification. The Beardmore challenges the belief that ‘green’ historic preservation and revitalization is cost prohibitive. While initial investments may be slightly more, they result in substantially lower operation costs and longer building life. The Beardmore illustrates that communities can adapt to new demands and preserve their historic treasures while providing sustainable economic revitalization. Located in downtown McCall, this 3.4 acre site was redeveloped with retail, restaurants, professional offices, residential units, and a historic hotel adjacent to a city park to create a sense of community. The project retained historic buildings including the hotel and train depot and formed a strong pedestrian realm with courtyards and outdoor eating. Green building practices such as green roofs are incorporated. An extensive public process guided the integration of building, sidewalk, and landscape improvements into this downtown lake front redevelopment plan. 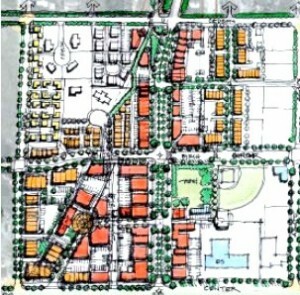 McCall’s Urban Renewal Agency began planning and designing the redevelopment of Legacy Park in 2007. The Hotel McCall and the Urban Renewal design teams worked together through community and stakeholder collaboration to create a cohesive downtown that links public and private properties. The Hotel McCall exceeded all the city standards for sidewalk widths and design. Landscaping on the northeast edge beautifies the highway corridor and plant species were selected to minimize obstruction of the lake view. The rehabilitation of existing buildings and redevelopment of the site strengthen and direct development toward the downtown core. A portion of the site is often used for public events and provides McCall’s residents and visitors a central place to gather and celebrate. 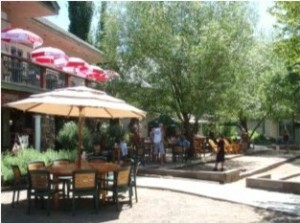 Throughout the summer months, the McCall Farmer’s Market is held on the property twice a week. Hotel McCall is an excellent example of a smart growth mixed use development located in the heart of downtown. Behind a retail center on a former industrial infill site, Meadow Ranch is one of 5 LEED for Neighborhood Development (ND) pilot projects accepted in Idaho. 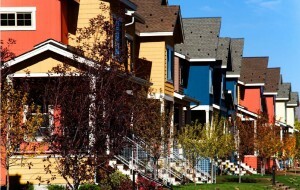 LEED ND integrates smart growth principles, urbanism, and green building setting a new standard for neighborhoods. By filling in a site previously zoned industrial, Meadow Ranch protects farmland and environmentally critical areas. Community collaboration including neighborhood meetings resulted in amending the City’s standards so smart growth principles could be implemented. A restored dairy barn from the 1940’s sets the tone and character with a new farmer’s market and transitions the nearby commercial to the new homes. A location ½ mile from walking trails, bike paths, bus routes and over a dozen community resources allows residents of Meadow Ranch to walk, bike or take public transportation to reach shops, schools, medical facilities, churches and more. Building design is compact, diverse and cost-effective at 19 units per acre with a variety of housing. Size and price are modest, ranging from 800 to 1800 square feet, all priced under $375,000. Registered under the LEED for Homes, housing has environmentally responsible finishes, and performs well with energy and water efficient fixtures and equipment such as heat pumps and 95% efficient water heaters. Lights, appliances, and windows are ENERGY STAR and use a fresh air ventilation system for indoor air quality. Nearly 30% of the site is preserved for open space. Other neighborhood amenities include, walking paths, apple orchards, a greenhouse and a Community Center targeting LEED ND Gold Certification. Meadow Ranch provides an example of new smart growth neighborhood infill that fits well into the surrounding community and provides new housing close to existing services. This residential project in Hailey has an impressive range of housing options with 13 building types from 650 square feet flats to 2000 square feet townhouses. It integrates well with the surrounding community and provides much needed affordable housing for residents in a growing recreational and second home market. Sweetwater is part of the LEED ND Pilot Program with pending certification which targets credits for ‘smart location,’ ‘linkage,’ ‘neighborhood pattern,’ and ‘design.’ Sweetwater illustrates how a well-planned, dense neighborhood can fit into the fabric of a rural community. The project provides 100% on-site storm water treatment and infiltration to recharge ground water, has energy efficient street lighting and all site lighting meets a strict night sky ordinance that exceeds LEED requirements. Over 1000 newly planted trees and most of the parking (of 1100 stalls) is tucked under buildings greatly reduce the heat island affect while enhancing the pleasant neighborhood character. A neighborhood of this size and density has never been constructed in Hailey. Unlike other developments which make density look unlivable by standing apart from the rest of the community, Sweetwater builds on the existing street grid and tightly connects to the adjacent neighborhoods. Buildings frame streets uninterrupted by parking. Porches, parks and courtyards provide ample space for residents to socialize, and the development is contained in many smaller buildings to mimic the scale and pattern of old Hailey. This compact design also allows nearly three acres of shared open space. 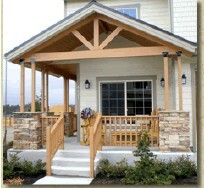 Sweetwater provides some of the densest housing in the Wood River Valley and is a new model for Idaho’s communities. Victor crafted and passed a Traditional Neighborhood Design (TND) overlay for a one mile square grid surrounding the city center that creates a one-half mile radius mixed use residential development area and provides a comfortable ten minute walk to the city center. The ordinance prescribes a mix of single-family, multi-family, and neighborhood oriented light commercial with design guidelines and an emphasis on comfortable pedestrian and bicyclist access to the downtown center. Victor’s relatively undeveloped central one mile grid has less than one structure per acre. Over the past fifteen years, the development pattern has been typical of that across the country with developers opting to develop low cost agricultural lands at the city’s edge for suburban subdivision sites. The real estate collapse of the past two years has forced an examination of conventional development sustainability. The TND Overlay is an answer to the high costs of suburban sprawl. Victor has an exemplary approach to revitalizing its downtown core and creating a vibrant center for this community which offers an opportunity for an organic smart growth approach to town-center residential and commercial development. This measure is the first step in a two step process to bring the city under a complete smart growth or form based code. With two projects already submitted and approved under the new ordinance, there is every indication this will be successful. Sherry McKibben – The President’s Award-Recognizing outstanding leadership in education, implementation and encouragement of smart growth. Sherry is a University of Idaho Associate Professor of Architecture and Director of the University’s Urban Research and Design Center (IURDC) in Boise. She teaches urban and community design principles on real community projects, ranging from a regional study to a design project for the Basque Block. This approach provides her students with real life experience while our communities get valuable services. When not teaching smart growth principles, Sherry is implementing them as a principal architect and urban designer with McKibben+Cooper Architects. The firm’s work includes the1700 acre mixed use Harris Ranch master plan; Downtown Caldwell’s Revitalization Strategy Plan including “day-lighting” Indian Creek; and Ada County’s Parks Administration Building, a LEED certified green building with the first modern ‘green roof’ in Idaho. McKibben+Cooper emphasizes smart growth principles in their work, improving projects and educating clients along the way. Their projects integrate smart growth with green design concepts including solar access, “green streets,” green roofs, energy and water conservation, and sustainable materials. Seven clients have won Grow Smart Awards. A graduate of the University of Oregon, Sherry has a Masters degree from Yale University and is LEED accredited. She volunteers her professional expertise in many ways as an active member of Urban Land Institute Idaho, the American Institute of Architects and US Green Building Council of Idaho. She founded the U of I Integrated Design Lab to educate building professionals and promote energy efficiency and is a devoted public speaker. Sherry does more than promote smart growth principles, she lives them! She and her husband live and work in a historic home in downtown Boise and walk/bike whenever possible.